Japan is to increase its submarine fleet for the first time in 36 years, the Sankei Shimbun reported Sunday. The plan apparently aims to counter China's naval build-up by partially filling the void created by the U.S. reduction of submarines in the Pacific area. The paper said the Japanese government plans to increase the number of submarines from the current 18 including two trainer submarines to more than 20 when it revises its Defense Program Guidelines by year's end. 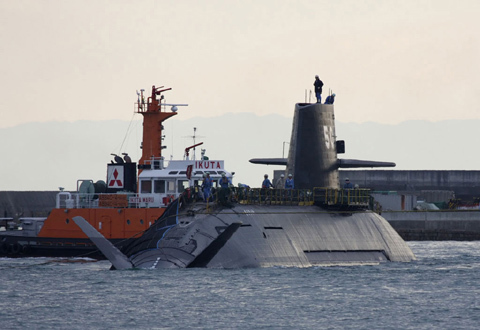 Tokyo has maintained 18 submarines since it first formulated the guidelines in 1976, although it has strengthened their capability by replacing superannuated vessels and with new ones. But now that advanced technology gives them a longer lifespan, it has opted for the new plan to increase the total number, the daily reported. Exactly how many the country will have is not known. Even more than 20 is no match for China, which has 62, but experts say most of the Japanese submarines are new types with superior capability. The immediate cause for the decision was apparently China's plan to build an oceangoing fleet. China declared the plan at a fleet review in Qingdao, Shandong Province in April. It envisions extending its area of operations to the Pacific and Indian Oceans. Out of the 62 Chinese submarines, seven are nuclear-powered and 55 diesel-powered. China recently built an underground submarine base on Hainan Island, which overlooks the South China Sea.